This gel helps to protect your skin head-to-toe from damage caused by dehydration. Though many skin care products focus on the hands or on the face, the rest of our skin is just as susceptible to drying out and suffering wear and tear. Many places such as knees, elbows, and heels can easily become so dry that small cracks appear; creating an opening for bacteria to enter the body. 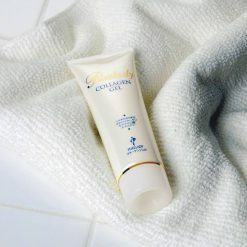 Collagen body gel is intended to help resolve this concerns, and to care for the skin over your whole body. It freshens and moisturizes, helping your skin to stay smooth and elastic, and is also gentle; making it great for those with sensitive skin. Apply as needed. Apply with particular thoroughness to areas of the skin that may be especially dry.This gel is truly multi-purpose: Some prefer to use this gel to care for the skin of their face and the nape of the neck, and some prefer to use it as a whole body lotion just after a bath. It can be used as a hand cream after washing dishes, or primarily to soften the skin of your knees and heels.Because this one gel can be used in so many different ways, it can free up space in your medicine cabinet that might otherwise be taken up by an array of other lotions. It is even the perfect gel for men to apply after shaving! This product contains water, propanediol, glycerin, glycosyl trehalose, hydrogenated starch hydrolysate, atelocollagen, sodium hyaluronate, hydrolyzed elastin, yeast, ubiquinone, squalane, Japanese rice bran oil, oryzanol, glycine soja sterols, hydrogenated lecithin, tocopherol, dipotassium glycyrrhizate, glyceryl caprate, polyglyceryl-2 laurate, polyglyceryl-10 laurate, xanthan gum, grapefruit seed extract, arginine, acrylates/C10-30 alkyl acrylate crosspolymer, phenoxyethanol, rosemary leaf extract..